Peonies are the most trendy flowers included in today’s arrangements. They are sweetly scented and relatively inexpensive. Their bulbs are large and their colors range from white to coral. They can be paired beautifully with many accent colors. Peonies are a sophisticated alternative to the rose. 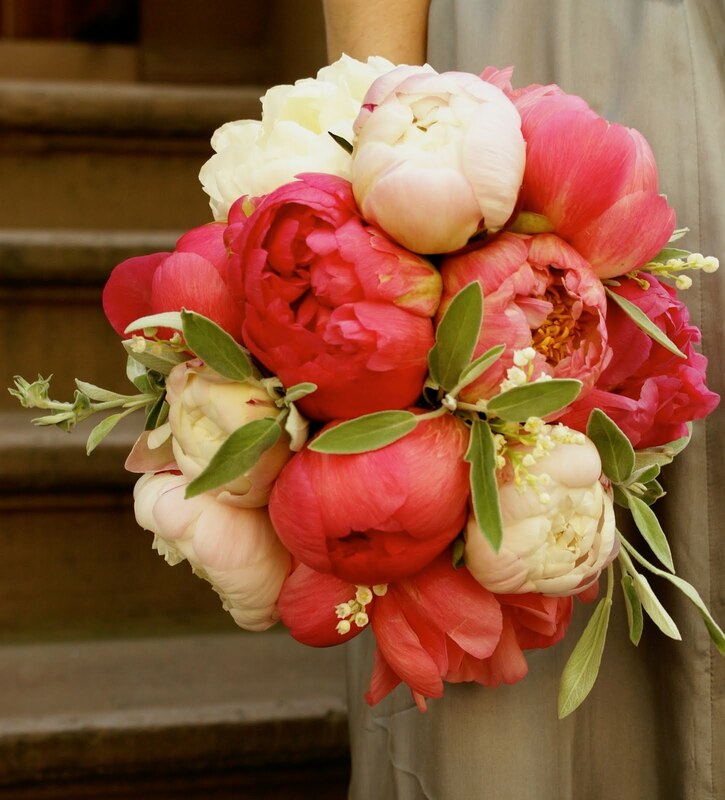 Peonies bloom in May and June, making them the perfect choice for your outdoor wedding. Here are five wedding themes that peonies compliment perfectly. 1. French Garden – French garden decor incorporates blue and green pastels with soft grey hues for a classic French look. Light pink peonies are a perfect way to maintain continuity with the pastels while introducing another color for added interest. 2. Classic Nautical – Nautical decor mixes neutral tones of navy blue, white, and tan for a classic look. Incorporating magenta or coral peonies add a bold punch of color to your decor while light pink or white peonies will add texture to your arrangements. Consider pairing light peonies with an additional accent color like yellow or red. 3. Rustic Barn – Rustic barn decor is all about lots of earth tones and texture. Mixing pines and other foliage with textured flowers is a great way to play up this effect. Peonies are very soft and delicate so using light colors like white or light pink intermixed with ferns and berries can create an interesting look. 4. Black Tie – Black tie weddings are focused on elegance. White peonies with smooth, dark green leaves can help create that clean, classic, and sophisticated look. 5. Shabby Chic – Shabby chic decor is all about color and texture. Any color peony works magically with a shabby chic look. Combine white, light pink, and magenta bulbs of different stages (some closed, some opened) for a natural look. The story of a military wife, entrepreneur, and photographer whose photographs are more than something to look at. Stephanie Needham and her husband Brandon. Just four Januarys ago, when she was in high school, Stephanie Needham met Brandon, a man destined to join the Marine Corps. In the four years since, Stephanie and Brandon did what many experience over the course of ten. They fell in love, got married, moved across the country, built a home, started their careers, and just recently finished making it through their first deployment. All the while, Needham explored her love for photography, making into a business. In her new home in Oceanside, California, she has created her own company, Stephanie Needham Photography, taking family portraits for military couples. For her, photography is so much more than simple images on paper. Soon, Stephanie would meet Brandon Needham who would spark a new passion in her life. At first, their relationship was hardly perfect. “We were on and off for a while, really, until he went off to officer school in college. About a year into our dating we kind of just stopped the fighting and kind of got ourselves together and started really just having a good relationship”, says the now nineteen year old. While Brandon was pursuing his dream of becoming a Marine, Needham focused on finishing high school and supporting her boyfriend. She couldn’t picture their relationship any other way. “I couldn’t imagine where we would be if we were together everyday and it was like a normal relationship. But I mean, when he went off to boot camp, it was only communication through letters which was the first time we were really apart and not talking. I think that just made our relationship so much stronger”, she says. For the three months he was away at boot camp, Needham wrote him every day. In March of 2011, Stephanie and Brandon got engaged. “Oh this is a good story”, she whispers followed by a sweet laugh. Brandon was in school in North Carolina, many hours and many miles away from New Jersey. Needham and her high school friend were spending the afternoon together when her friend suggested going to Round Valley Reservoir in Clinton, New Jersey to hang out. “We get out of the car and Brandon’s standing there in his uniform. I was completely surprised! I ran over to him and he got down on one knee and asked me to marry him”, Needham explains. In the same summer of their wedding, when Stephanie was eighteen and Brandon was twenty, they moved to Southern California with nothing but five suitcases. Newlywed life presented challenges. “We had never really actually lived together”, Needham says. The most difficult part of marriage is figuring out “who’s going to do the dishes, because we never agree on that,” Needham chuckles. “He’s a neat freak and I’m not a slob but I’m not a neat freak like him, so we kind of disagree on things. But you kind of learn to just deal with each other and you have to really compromise. I mean that’s kind of like the biggest thing is learning to compromise with each other,” she shares. In January of 2012, after beginning to adjust and enjoy married life, Brandon was deployed to Afghanistan. “I cried a lot. It was hard. There were a lot of things going through my mind. I knew that he was going out on missions and that there obviously was danger in it, but I really just tried not to think about it”, Needham says. She sought comfort in her friendships with other military wives. Now that Brandon was overseas, Needham embarked on a personal journey of her own. At first, Needham worked as a nanny for a little girl nearby the base in Camp Pendleton, California. On the side, Needham began her photography business. “There are a lot of other photographers out here that I really was just inspired from and I figured I might as well just try it out. So I made a Facebook page and I kind of just tried to get my name out there. I was doing sessions for really cheap and I finally started getting a lot of people with sessions. I mean, each session that I have, I feel like I grow and learn more from,” she says. After Brandon deployed, Needham delved into her photography even more. “It’s honestly just really about capturing moments for people and giving them something to look at and to be happy about. The most rewarding part is just getting feedback from people saying how happy they are to have good pictures to look at and just being happy making my customers happy”, she says. “There’s this little girl that I’ve taken actually a few sessions for, and this past one with her family, we did a really cool location. It was a barn out in wine country out east. It was my favorite session. The little girl, she loves being photographed so it always makes it easier”, she laughs. It was one of Needham’s customers who got her a new job as a photographer and assistant manager for a rustic chic wedding décor boutique on etsy.com. She works at their headquarters in Southern California, taking pictures of their merchandise to upload to their etsy.com site and loves it. 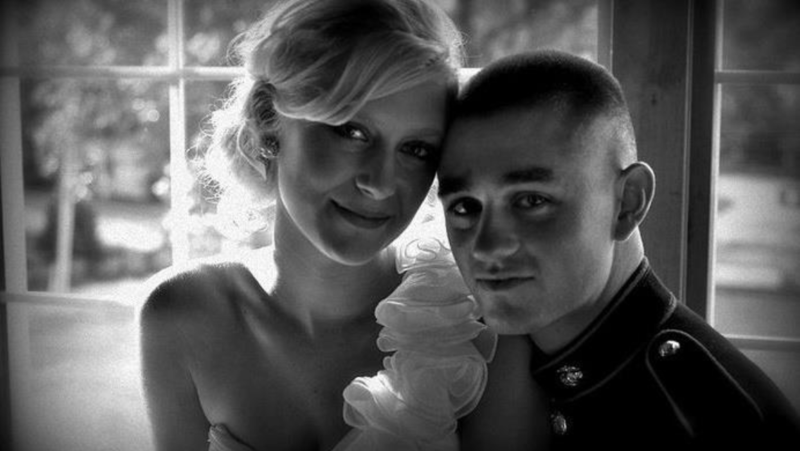 A year later, Brandon returned from Camp Leatherneck in Afghanistan to California. “It was amazing. It was so nice to have him home again and be able to just kiss him and everything and not be alone anymore. He got about a week off and I took off of work so we really just had time to spend with each other”, Needham shares. Needham continues to photograph military couples, a subject close to her heart. Throughout Brandon’s deployment, Needham decorated their apartment with photographs so that she could see Brandon every day. Needham hopes to provide that same comfort for other military spouses with her work. Needham plans to expand her business over time once she is finished with school and has more time to devote to it. The couple realizes Brandon will be deployed again. He has six more years in the Marine Corps, but Needham is excited for their future. Making your wedding unique is one of the many exciting challenges of planning your special day. Take on the challenge by incorporating family heirlooms into your wedding, making your wedding day unique to you and your fiancé. Here are five of the best ways to personalize your wedding using things you already have. Many vintage dresses have beautiful lace detailing that can be used to create a belt or a headpiece to pair with your wedding dress. Ask your mother or grandmother if you can use a piece of lace from their gowns to incorporate into your own. Creative seamstresses can find ways to do this. Also, you can contact design company, LeFlowers, on etsy.com for a custom look. If you want to do something a little bit different, use the lace from the vintage dress to make a necklace. Create a fabric statement necklace with lace and ribbon. For a subtler look, jewelry design company greengrassgifts on etsy.com will create handmade pendants with lace that you send them. Wear jewelry that has been passed down through the generations. Borrow the earrings or the necklace that your mother wore on her wedding day. You can even borrow from an aunt or your grandmother. Combining pieces from different generations is a thoughtful way to honor your family and add interest to your outfit. Vintage inspired jewelry is an increasingly popular trend. Why not use actual vintage pieces? Consider including antique furniture that has been in the family for years when decorating your venue. Antique chairs, benches, vases, and dressers are great for decorating the area where your ceremony will be taking place. This tip is particularly helpful for outdoor weddings. Bringing the indoors out is one way to make an outdoor space feel cozy and intimate. Including items given to you by family members adds meaning to your wedding decor. 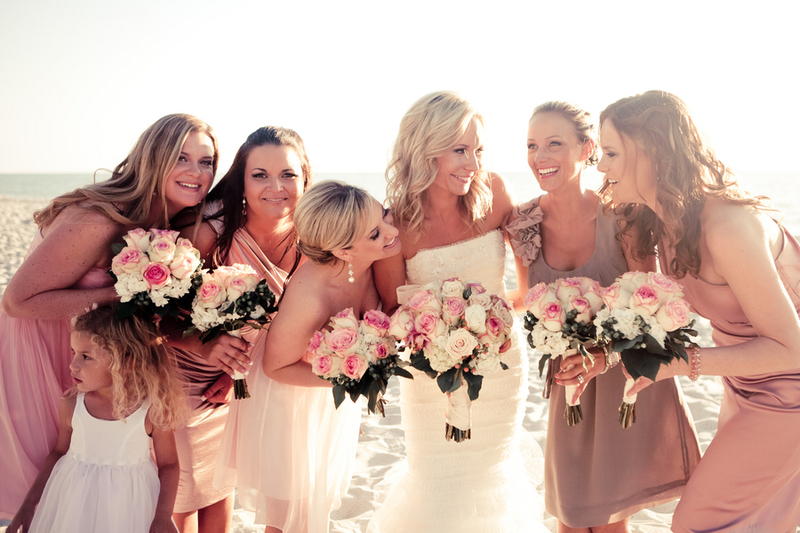 For your bridal bouquet, choose flowers that have been used in previous weddings in your family’s history. For the rest of your wedding, choose whichever flowers you want. Your bridal bouquet can include the “family flowers” in addition to what you’ve selected as a tribute to the past, present, and the future. Collect photos from your and your fiancé’s family members. Include wedding photos from parents, grandparents, and even siblings. Include one of your engagement photos as well. 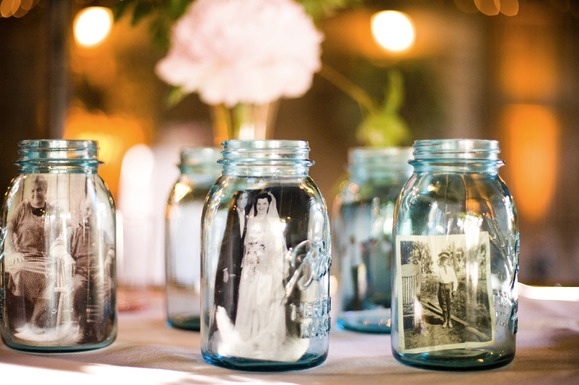 Gather mason jars and insert the photos into the jars. Display them around flower arrangements on table settings. This is a great conversation piece for guests. You can also set up a table in the back of the reception area with old and new family wedding photos displayed. Scavenge for old frames at a local thrift shop. Paint them to match your color scheme and place the family photos inside. This is a beautiful and simple way to honor the union of your families. Interview with Owner and Creative Director of Rustic Charm! This week I was fortunate enough to interview owner and creative director of Rustic Charm-Vintage Styled Events & Rentals, Erica! Rustic Charm is located in New Jersey but is willing to work just about anywhere! Erica and her mother work together, searching high and low for beautifully unique pieces to add an element of surprise to your special event. Yup, her job sounds like a dream! 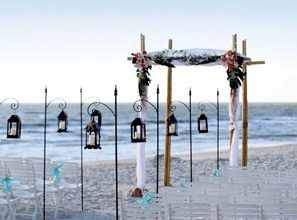 Rustic Charm has even decorated for outdoor weddings! Read this interview and check out their website for more inspiration! 1. What is the best way to personalize an outdoor space? Our goal at Rustic Charm – Vintage Styled Event and Rentals is to make every event of photo shoot a one-and-only. When our clients come to us to rent our props and furniture it’s up to their creative discretion to make the effects and outcome what they dream up. On the other hand, when we are selected as a prop and styling resource for events, we have honed our approach to take a styled event to the next level – especially where it concerns an outdoor space. For our team, we start with two approaches. First, it’s important to do a walk-through of a space, whether indoor or out, to get an idea of how many pieces you’ll need to achieve all the elements that go into a styled event. Secondly, when possible we like to do at least one sit down meeting with our clients to develop an understanding of their personalities – this aids us in making an event more personalized and unique. It really comes down to what the event is about and who or what is being celebrated. From there, it goes beyond the furniture and props, to even the smallest of details. For example, if we know that a couple is celebrating their anniversary, we make sure to incorporate components of their life together in what we display. There are so many moving parts to this, but the best way to personalize a space is to make it truly inventive and unique to the individuals. On the other hand, if we are doing a commercial photo shoot and the sky is the limit for décor, then we try to garner inspiration from something personal to us, for example, a “Father of the Bride” at home soiree, or woodland themed tea party inspired by Alice in Wonderland. The options are limitless! 2. How can you make an outdoor space cozy while taking advantage of the openness of the outdoors? One of my favorite spaces to decorate is an outdoor space. To make an outdoor space cozy in combination with the elements and openness of the outdoors, it’s important to keep in mind the logistics and the amount of literal ground you have to cover with furniture and décor. For example, a very large open outdoor space is going to require the incorporation of bigger pieces to pull everything together, such as a larger sized dresser, or at the very least a variety of smaller props that will bring everything together in harmony. The trick isn’t to overcompensate; as you don’t want the props competing with the natural elements of what’s outdoors, the purpose is to compliment what is already there. At Rustic Charm, our preference is to style with repurposed, more natural pieces. A great way to take advantage of an outdoor canvas is to combine it with the comforts of what one might find inside of a home – this establishes a balanced, relaxed look and feel, and often times is exactly what our clients hope to achieve. 3. What is the shopping process like? Our goal is to present unique and timeless pieces to our clients. When sourcing props for Rustic Charm – nowhere is off limits. We simply love the hunt! Often times when searching for our vintage props and accessories, we find hidden gems in the most unexpected places. At times we venture across borders, out of state doing style searches – scavenging small and large flea markets, auctions, estate sales, and small antique shops off the beaten path. It’s often the overlooked places where we scoop up the best deals and rarest pieces. For our team, it comes down to making a real connection with people, sellers and dealers – the majority of those we share our business story with are more than happy to share insider secrets and tips with us, and also the places they love to hunt for a great find. It all comes down to staying informed, a lot of research, countless road trips, and hours and hours of scouring high and low places for that one, amazing piece. As we continue to build our collection, it’s been important to keep track of everything and then deliver it in a way that clients can easily browse our offerings – therefore, we are currently in the process of updating our site so that each piece in our inventory has its own name and a catalog code for clients to easily select from. 4. What is one of your favorite pieces you have collected? One of my favorite pieces, which also happens to be one of the first pieces I bought for Rustic Charm, is a vintage black typewriter. I discovered it one afternoon at an antique shop; it was hidden underneath an old cupboard – a writer by trade I was immediately intrigued by this piece and thoughts of who once used it. How many hours were spent bent over it – did someone use it to write letters? To pen love notes to someone? Was it used just for business memos? These questions piqued my attention further – and I had to make it offer on it. I was thrilled that day to add it to our ever-budding collection. There are so many other props that I love and I will admit that one of the most difficult parts is not adding our business finds to our own homes – it can be very tempting at times, but we try to reserve ‘decorating to our heart’s content’ for our clients. 5. Where do you get most of your creative inspiration? 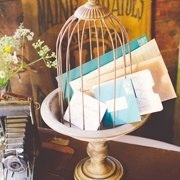 There are so many inspired possibilities for making special events truly distinctive. Honestly, my partner and I have always had a knack for decorating and styling spaces with unexpected pieces. We both strive to place hints of surprise in everything we stage – whether for a photo shoot or a more intimate gathering. It’s been so refreshing to see many people, including brides and photographers, turn away from the one-size-fits-all venue. Our inspirations come in many forms. For me, I often find myself flipping through a home catalog or design publication and a light bulb goes off with something creative I have to try – I’ll rip out one page out of an entire magazine because I get that a-ha moment. Another great tool of inspiration is simply being out and about scavenging for furniture and props – often times it’s when we are on a shopping excursion for new pieces that we’ll stumble upon something and think about how we could use it differently. A good example of this, we’ve taken old wooden ladders and between its slats laid a flat panel of wood to create a standing display table. Another tool of inspiration has been Pinterest; this creative resource is helpful for us to see what is “of the moment.” This gives us a heads up in terms of what is inundating the market or style pages, if you will, and then we’re able to head in the opposite direction. We like to march to our own stylistic beat and give our clients true, one-of-a-kind staging. 6. What is one of your favorite events you designed and decorated? One of my favorite events that we designed and styled was a recent wedding in Chestnut Hill – near Philadelphia, Pennsylvania. Actually, I should start by saying this was one of my favorites because it was one of the most challenging events I’ve done to date. The venue that this particular bride and groom chose had a very limited amount of space to work off of in terms of decorating. And while I was able to visit the venue prior to the day-of the event, there was a wedding taking place at the time so I was unable to do my usual measuring and planning tactics during my initial on-site review. The day of the event, I brought with us everything and anything I thought we could possibly need to pull off every wish of this client, whose bohemian-inspired style requested a whimsical outdoor ceremony and reception. Taking into consideration her own personal style, we incorporated the natural outdoors with artistic emphasis on the ceremony. After countless hours of prepping, I’ve never been so satisfied with an event. As much as you prepare, there are always other factors, such as other vendor’s decisions, that can take you by surprise right when you’re down to the wire. In the end, we triumphed and the bride was overjoyed with the result. Sometimes the most challenging events, turn out to be the most rewarding. 7. What was your favorite decorative detail at your own wedding? Wow, that’s a tough question as there were SO many elements of our wedding that I absolutely loved. If I had to choose one prop that meant a lot to me – it’d have to be the bible my mom (and co-founder of Rustic Charm) uncovered for our big day. This tattered bible from the 1500s made for a sentimental and perfect piece for our ring bearer, my nephew, to carry down the aisle. We wrapped it in twine as the binding had come loose over time and added a few pieces of grain — while it held a stylistic element, it also held so much meaning to both my husband and me as we exchanged our vows. Additionally, another favorite detail was this old shabby chic door that I had uncovered soon after we got engaged – we added a piece of vintage lace over the top of it and used it as a standalone prop in the reception area. This was one of many unique backdrops that we repurposed for our guests to enjoy while they mingled about and celebrated with us. About Us: Rustic Charm – Vintage Styled Events & Rentals has created a stir by capturing the timeless simplicity and warmth of yesteryear. Every wedding, event and professional photo shoot is as unique as the clients who come to us. For those seeking event décor and prop resources through our array of inventory of casual chic furniture, vintage props and accessories, we supply rare and quality vintage pieces to those hoping to achieve a one-of-a-kind casual-chic setting. Through our ever-growing collection, we put an original and inviting atmosphere on display.